So I'm working on a 2.5D game that has loops. My entire issue here is no matter what, my character's Z position is always 0. I've tried using triggers that set the character's Z position with no luck. The red path is the one my character is currently taking, locked on the Z axis, and the blue path is the one I would like my character to take. 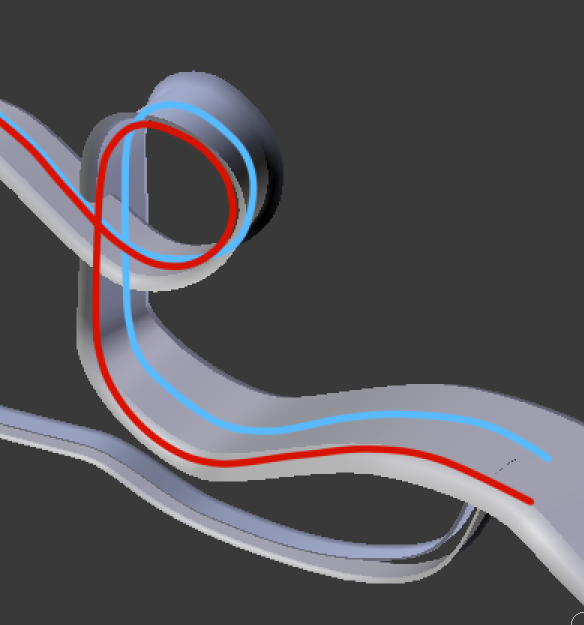 So my main question is, what is a good spline asset and how can I make my character follow it? All I can really suggest is to try to isolate the issue as much as possible. This will help you narrow down the possible causes. Maybe an animator controller or root motion is locking the position? // whatever you want the Z position to be. // cache the transform to improve performance. It's not using root motion, but I could check the movement scripts to see if that's the issue. I can't find anywhere in scripts where the Z axis is locked; I've tried moving the character along Z in play mode which actually works until I jump. If it helps, the engine I'm working with is called Sonic Realms and it's built only for 2D which is probably why I can't seem to modify the Z axis during runtime. Then the jump method is definitely resetting the Z position and probably some other function is doing so at startup. You need to remember that every bit of code that touches the transform position will probably also be resetting the z axis/position. So this might be hard to change or track down. However, I've added a simple hack to the answer above that might help you for now. If you're using physics to move you should also check and see if you have the rigidbody's Z axis frozen under constraints. If you're using 2D physics than you would need to either switch to the 3D physics system or just stop setting the position through physics.